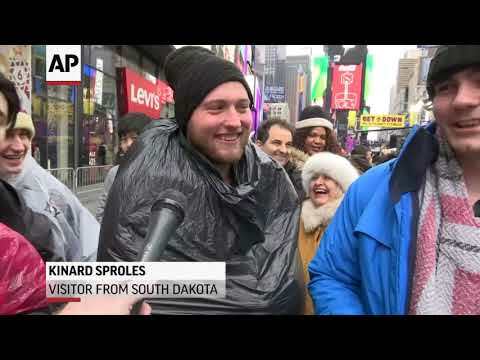 NEW YORK (AP) — Rain drops fell along with confetti as revelers rang in 2019 in New York’s Times Square, capping a soggy New Year’s Eve celebration that included singer-songwriter Bebe Rexha’s stirring rendition of John Lennon’s “Imagine” just before midnight. Crews used squeegees to try to remove water from the stages, but New Kids On The Block still splashed up puddles late Monday while performing their hit “Step by Step” on a giant set of steps. At midnight, fireworks erupted over Times Square, couples kissed, families hugged and “Auld Lang Syne” played over loud speakers. Thousands of police officers patrolled with the help of bomb-sniffing dogs, 1,225 security cameras and 235 “blocker vehicles” used to stop potential vehicle attacks. The event went off safely, with no major disruptions, though the rain forced police to cancel plans to deploy a drone to help monitor the crowd. Veterans of the celebration said the rain wasn’t all that bad, considering last year was one of the coldest on record at 10 degrees Fahrenheit (-12 Celsius). This year, the temperature was about 47 degrees Fahrenheit (8 degrees Celsius) as midnight struck. “We’re troopers. We got this,” said Nyia Williamson, 41, a self-described New Kids On The “Block Head” who was at the party for the 11th time. “It was a massive mistake,” Peter Walsh, 24, said of his decision to attend, after hours spent in the gloom. Justine Brenkel, 26, from Lyon, France, said being in Times Square on New Year’s Eve was on her “bucket-list,” but the hours of waiting were turning it into a bit of a disappointment. The final 60-second countdown happened as a geodesic sphere — 12-feet (3.5-meters) in diameter, covered with 2,688 Waterford crystal triangles and lit by 32,256 LEDs — dropped down a pole. The numerals “2019” lit up at midnight accompanied by pyrotechnics and the release of 3,000 pounds of confetti. Asked what they’re looking forward to in 2019, revelers spoke of new jobs, getting married and spending more time with their families. One said he’d like to win the lottery. Maryanne Clarke, 52, of Waterville, Ohio, said she was there to “celebrate the possibility of 2019,” after a year in which she was diagnosed with breast cancer and underwent a round of chemotherapy. Clarke and her 14-year-old daughter, Shannon, joined the crowd in singing along as Rexha performed “Imagine” to close 2018.